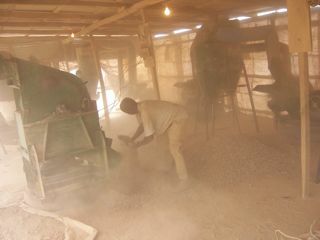 Miners in Nigeria grinding gold ore with significant exposures to lead and silica dust. The mining sector is responsible for some of the largest releases of heavy metals into the environment of any industry. It also releases other air pollutants including sulfur dioxide and nitrogen oxides in addition to leaving behind tons of waste tailings, slag, and acid drainage. Occupational and environmental exposure to heavy metals, silica, and asbestos can occur during mining and milling operations. The smelting process (extracting the metal from the ore) is associated with the highest exposures and environmental releases. The hazards to human health caused by exposure to heavy metals – including lead, cadmium and mercury – have been thoroughly documented. These metals are associated with a range of neurological deficits in both children and adults in addition to a range of other systemic effects. Exposure to airborne silica and asbestos can cause lung cancer, pneumoconiosis and numerous other health effects. Airborne emissions from metal mining and smelting in Australia, Canada, and the U.S. While pollution controls can minimize exposures to workers and surrounding communities, these safeguards are often absent in mining and smelting operations in developing countries. Even relatively efficient mining operations result in enormous waste, emissions to air and water, and a legacy of environmental contamination in nearby communities. Around the world, unsafe mining and smelting practices have been responsible for a continuing series of environmental and human health disasters, which cause great human tragedy and undermine social stability, economic development and sustainability goals. Reduced lead and silica dust exposures were measured following the introduction of wet spray misting equipment in OK International’s pilot project site in Nigeria. More commonly, small-scale gold mining utilizes significant quantities of mercury to extract gold from the ore. Exposure to mercury in these operations not only endangers miners and their families, but is also detrimental to the environment when deposited into the water supply. Artisanal gold mining employs an estimated 10-15 million miners in more than 55 countries.7 Estimates are that these small operations produce about 20% of the world's gold supply. Many studies have documented significant mercury exposures in these gold mining communities. In the Madre de Dios region of Peru, gold shops serving small artisanal miners were found to have mercury levels that were more than 20 times the World Health Organization (WHO) occupational health standard for mercury.8 This region of Peru alone has over 20,000 informal gold mining operations. 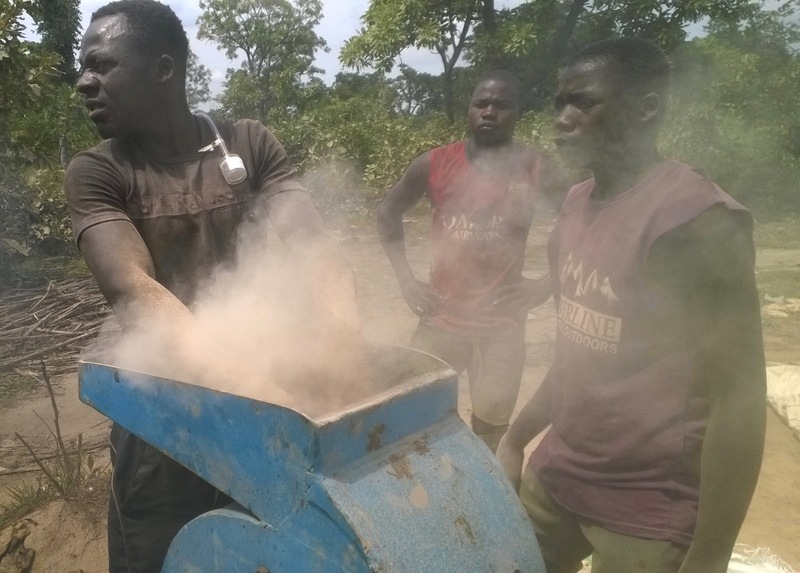 Grinding and crushing operations in gold processing result in unsafe exposures to lead, arsenic, and silica dust. 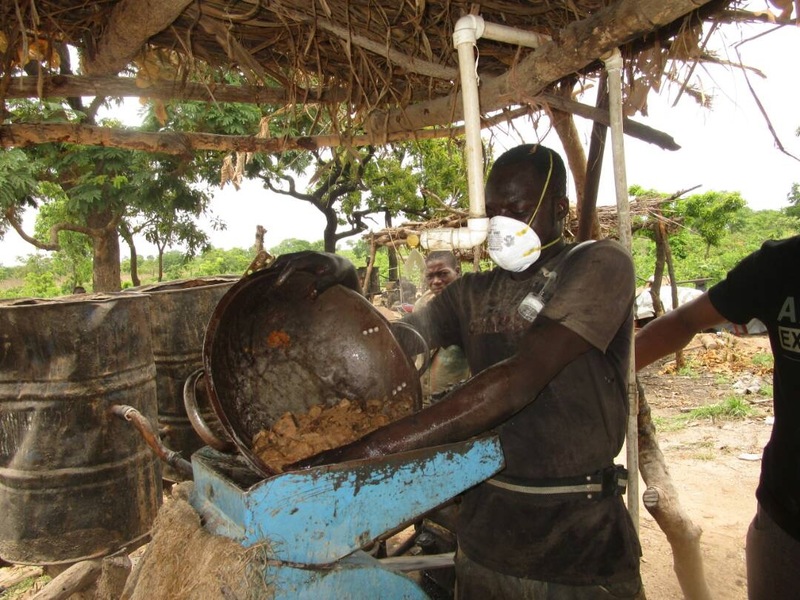 In 2012, OK International conducted an investigation of artisanal small-scale mines (ASM) throughout Nigeria to assess health hazards in an effort to prevent tragedies like the one in Zamfara. We visited gold mines, ore processing sites and lead mines where we collected soil and water samples and completed a hazard evaluation for each site. We also worked with the Nigerian Ministry of Mines and Steel Development (MMSD) in coordination with other government agencies to conduct a three-day training session to increase the capacity within government agencies to evaluate hazards in ASM. Soil samples collected around gold ore processing at one site had lead concentrations as high as 1% in a location where miners also slept and ate. These concentrations pose a significant health risk to both the miners and surrounding communities. Not surprisingly, lead concentrations were also very high around artisanal lead mines where the ore had as much as 18% lead. We also found soil to be contaminated with mercury at gold processing sites where children were conducting amalgamation processes. In addition to the hazards of toxic metals in the ore, we noted very high silica dust exposures in ore processing. Although some resources have been devoted to environmental remediation and medical treatment of poisoned children in Zamfara, little attention is being paid to the extent of the problem in other areas of Nigeria. There is no national or state level database of artisanal mines in Nigeria and information about the metal content in ore is lacking. Raising awareness among miners of the hazards and safer mining practices is desperately needed at ASM sites throughout Nigeria in order to prevent the occurrence of more lead and mercury contamination and silicosis. We are also recommending that the Nigerian authorities conduct a more thorough investigation of gold mines outside Zamfara to characterize locations with significant lead exposure. In recent decades the U.S. has gradually shifted the most polluting aspects of the mining industry to developing countries. This shift is particularly clear in the case of lead ore processing. Today the U.S. exports almost all of the lead ore it mines for processing in countries with weaker environmental and occupational regulations and limited resources for enforcement. This trend has accelerated since the last primary lead smelter in the U.S. closed in 2013. 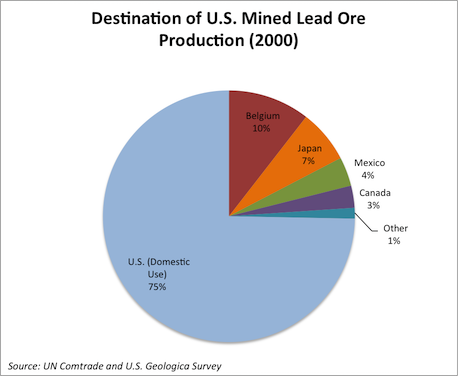 The pie charts below show the destination of mined lead ore from 2000 to the present. 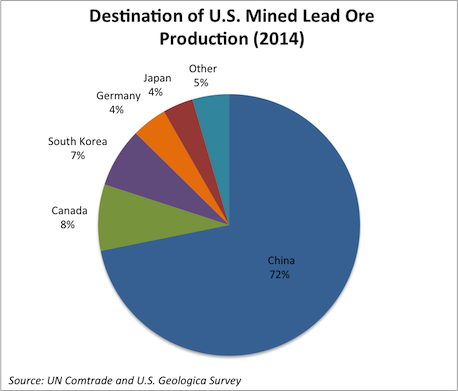 In 2000, 75% of lead ore mined in the U.S. was used domestically, but in recent years more than 70% was exported to China for processing. 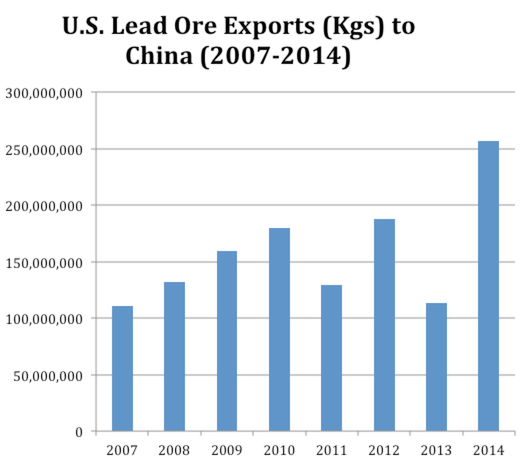 The graph below shows that lead ore exports from the U.S. to China doubled between 2007 and 2014. China has reported more than 30 lead poisoning incidents around lead smelters and battery recycling plants since 2009. Moreover, changes in the global economy threaten to increase the harm caused by unsafe mining and smelting practices. Growing demand for metals and increasing commodity prices are encouraging expansion of both formal and small-scale mining and recycling around the world. In addition, initiatives aimed at reducing global carbon emissions can have the unintended consequence of increasing lead poisoning in developing countries. For example, the adoption of solar, wind power and electric vehicles is increasing demand for lead batteries. The development of new applications for larger lithium ion batteries is significantly increasing the demand for lithium, cobalt, manganese and other metals. This trend may continue if plans to accelerate the production of electric and hybrid vehicles are realized. The response to the reported mass poisoning incidents surrounding mining and smelting operations is predictably similar from country to country: shock upon discovery of the problem, medical treatment of survivors (to the extent that resources are available), and a call for huge sums to remediate environmental contamination. In most cases no one is left to cover the costs of environmental cleanup or even to compensate workers harmed on the job. A new approach is needed to prevent these human health impacts and environmental contamination before the damage is done. OK International is therefore calling for a global campaign to end dangerous mining, smelting and recycling practices that poison children, workers, and families in developing countries and leave adjacent communities devastated by widespread contamination. These efforts will instead encourage the adoption of improved practices in the most hazardous mining and smelting operations. This campaign would engage technical experts, create multi-stakeholder partnerships, develop and promote consensus standards, and link safety, health and environmental concerns with economic development. The campaign's goal is to change the norms of practice to prevent environmental contamination before medical treatment and costly cleanup operations are needed. 1 Soto-Jiménez MF, Flegal AR. “Childhood poisoning from a smelter in Torreon, Mexico.” Environmental Research 111 (2011): 590-596. 2 Pirrone N, et al. “Global Mercury Emissions to the atmosphere from anthropogenic and natural sources.” Atmospheric Chemistry and Physics 10 (2010): 5951-5964. 3 Telmer KH, Veiga MM. “World emissions of mercury from artisanal and small scale gold mining.” in Mercury Fate and Transport in the Global Atmosphere (2009): 131-172. 4 National Pollutant Release Inventory (Canada), National Pollutant Inventory (Australia), and Toxic Release Inventory (U.S.). 6 Eckley CS, Gustin M, Marsik F, Miller MB. “Measurement of surface mercury fluxes at active industrial gold mines in Nevada (USA).” Science of the Total Environment 409. 3 (2011): 514-22. 7 United Nations Environment Programme. “Draft business plan of the artisanal and small scale gold mining (ASGM) partnership area.” August 7, 2008. 8 Environmental Health News. “Townspeople, gold shopkeepers highly exposed to mercury in Peru.” April 11, 2011. 9 International Labour Organization. “Children in hazardous work.” 2011.